NIAGARA FALLS, N.Y. -- New York Air National Guard Col. Gary R. Charlton II, a Skaneateles resident, will take command of the 107th Attack Wing during a ceremony here on Saturday, Nov. 17. Charlton replaces Col. Robert Kilgore, who has commanded the wing since 2015. Members of the press are invited to attend the ceremony. WHAT: A traditional change of command ceremony in which the wing's guidon, or flag, will be transferred from Kilgore to Charlton. This ceremony originally indicated to soldiers on the battlefield who they should follow in combat. WHERE: Niagara Falls Air Reserve Station, Niagara Falls, NY. Hanger 707. Members of the media must contact Master Sgt. Brandy Fowler at 716-236-3279 no later than 11:00 A.M. on Saturday, Nov. 17, for access to this secure military facility. Interviews with Col. Robert Kilgore and Col. Gary Charlton and video and still imagery of the ceremony. Colonel Gary R. Charlton II has served as the wing vice commander of the 107th Attack Wing since May 2016. Charlton enlisted in the Air National Guard in 1990 becoming a fuel systems technician. He graduated from Columbia College in 1995 earning a Bachelor of Arts degree in psychology. He is a senior pilot with more than 2,700 flying hours, including four combat deployments flying over 100 F-16C Fighting Falcon combat missions in support of operations Iraqi Freedom and Enduring Freedom. While he was enlisted, Charlton deployed in support of operations Desert Shield, Desert Storm and Northern Watch on two separate occasions. Col. Robert G. Kilgore took command of the 107th when it was designated an airlift wing, Jan. 24, 2015 and commanded the wing through a conversion with a new aircraft, the MQ-9 Reaper, remotely piloted aircraft (RPA) and an new designation as the 107th Attack Wing. Kilgore was born Aug. 19 1966 in Philadelphia, Pa. He graduated from Shenedehowa High School in Clifton Park, N.Y. and graduated from the U.S. Air Force Academy in 1988. He earned a Masters Degree in managerial economics from the University of Oklahoma, Okla., in 1999. Following Undergraduate Pilot Training in 1989, he completed follow on training in the KC-135R Stratotanker. He served on active duty for over nine years flying the KC-135R at Altus Air Force Base, Okla., and Kadena Air Base, Japan. Col. Kilgore joined the New York Air National Guard in 1997. Since joining the 107th ATKW, Col. Kilgore has served as an instructor pilot and evaluator pilot. 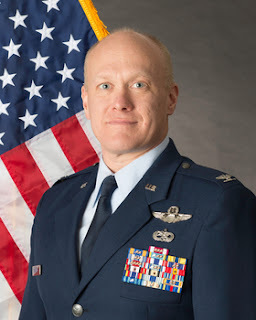 He has been a flight commander, operations officer and squadron commander of the 136th AirRefueling Squadron, 107th Maintenance Group commander as well as the 107th ATKW vice wing commander. A combat veteran, Col. Kilgore has served in operations Desert Storm, Desert Shield, Desert Strike, Iraqi Freedom and Enduring Freedom. He has deployed as both the operations officer and detachment commander. He is a command pilot with more than 4,300 hours in the KC-135R and C-130 H2. His next assignment will be at New York National Guard headquarters in Latham, N.Y. The 107th Attack Wing has been a part of the Western New York community since 1946, flying more than 10 different aircraft. The unit is a New York National Guard asset and falls under the command of the governor of New York State, Andrew M. Cuomo when not federally activated. The wing is activated for domestic operations in the area as well as serves a federal mission flying the MQ-9 Reaper, RPA. The 107th was officially re-designated the 107th Attack Wing on March 15, 2017. The name change reflects the wing's mission of providing aircrew members and supporting staff trained to operate the MQ-9 Reaper remotely piloted aircraft. The wing began transformation and training of crews and personnel in 2014.The 107th is the second New York Air National Guard wing to assume the remotely piloted aircraft mission. The wing is based at Niagara Falls Air Reserve Station and is also responsible for the 274th Air Support Operation Squadron at Syracuse, NY and the 222nd Command and Control Squadron in Chantilly, Virginia/Rome, NY. The 107th ATKW now employs more than 630 individuals.